Captions will be accepted from the moment this post goes live until Friday, July 10 at 10 a.m. Mountain Time. The winner will receive a box of specially-selected mystery electronics that we've assembled. We don't want to give the contents away, but let's just say passers-by have been caressing it enviously, and its value is somewhere in the $200 range. Now get to it! Luigi is disappointed to learn that "bash shell" had nothing to do with crushing koopa troopas. "This'll teach Marioduino to split the community"
Instead of searching the castles manually like a red hatted noob, Luigi came up with a better way of locating the ever missing Princess Peach. How do you control this thing? Oh, the Shell Command of course! The pit crew for team Nintendo can get lonely at times. What?! ...Mario has been using the Konami code the whole time! Who knew it would be so hard to write a shell script? Fueled by jealousy and a lifetime of sibling rivalry, Luigi plots to ensure he will never again hear, "Sorry, but the princess is in your brother's castle." Luigi debugs an attempt to use a wrench library to fix a BSOD (Blue Shell Of Death). At least the AVC robots traversing the Shortcut of Doom will not fight back. This is what Farmers.com hooked me up with? Real Life Mario Kart... Finally a pastime for Italian American Plumbers who like to make robots. Take me to your leader. Now! Just a moment Mario. I'm adding a low pass filter for the IMU sensor. After Luigi's spectacular and well-documented disaster in 1985, no one dared attempt another AVC for 24 years. Make them autonomous, they said. What's the worst that could happen, they said. Forget about cshell, kornshell, or bourne shell. I use blue shell, and it's super effective. I'm afraid this had the opposite effect than helping him meet a princess. He'd have finished sooner, but a gorilla was throwing barrels at him. He had to hit his head on a lot of bricks to save enough money to build this. I hope he's careful or he'll be disappointed in the actual number of lives he has. We've been apprehensive about him finishing this project because next come the GMO raccoon experiments. He'd touch it if he weren't worried about being little again. I'm sorry the other AVCs were mean to you. But it does get better, I promise. What! My brother fell into a Pipe on the way over here! Luigi's kart deflection algorithm is sure to wow the audience at the upcoming Mario Kart 9 friendlies. With his newly-acquired programming skills, Luigi is about to show his brother the true meaning of "one-up". This guy is clearly a virgin AVC competitor! First stop is hacking this green mushroom, next stop is to consquer the castle! Princess here I come! Luigi finally found a programming language he can understand, Logo. Now that he has control of the turtle his opponents have no chance! Blue Shell: "Bwahaha! And everyone thinks he is controlling ME! Alright, Luigi, push that key there. That's right. Now, get ready to jump, I want that power up!" Too late for Star Wars :Episode VII tryouts, next best thing was AVC. After all those years of playing video games this is what Nathan Seidle thinks Ai should look like. A quick bit of shell bashing after Luigi is reminded by the AVC staff that flight is not allowed this year. Tired of being the "sidekick" Luigi decided to hack the game a little and race with the blue shell. I wonder what will happen when he is in first place? We are growing so fast some people have to work outside and use substitute chairs and desks. On his first day as new CEO of Sparkfun, Luigi looks at the new Sparkfun logo in green. Before releasing his new creation, Luigi protects it with a special algorithm he likes to call "spiny shell." Luigi finishing the remote upload to take Donkey Kong out first place. "Bingo! Oh ho ho ho!" When I finish this upgrade, they'll have to call it Luigi cart. "Evil laugh sound..."
mumbles "This will teach Mario to throw a banana peel at me... "
~~ SHELL COMMAND ~~ don't target me ~~ SHELL COMMAND ~~ Command Error Why won't this work? Darn it Mario! I told you NOT to use that cheap imitation Arduino. You should've used our S.F. Red Board. While surfing the Internet, Clark fails to realize he has placed himself in grave danger by sitting on the wrong side of the safety barrier, at the "running of the robots" event in Spain. After Godzilla fails to destroy Clark for fashion crimes, the Asian fashion police send the dreaded Gamera to "finish the job correctly." Clark makes a subtle adjustment to the programming of his new "hay crapping" robot. His obsession with Luigi was cute when he was young, but now it's just creepy. Clark attempts to destroy his new robot overlord, Gamera, by opening a shell command prompt and typing "rm -rf star dot star". Gamera is less than pleased at Clark for his efforts and turns him into a well known game character as punishment. Gamera then returns to the task at hand-- sorting hay into cubes. In its latest fait accompli, Amazon delivers it's first item, (a hat), using the new Gamera delivery system developed shortly after the FCC put a stop to the drone overlords delivery system. After powering up his new AI "Horta", Clark is amazed at its first words-- "No kill I". After installing new "anti-children riding spikes", to his new Gamera robot, Clark re-initializes the device. Realizing he has a chance to win the race, Luigi works feverishly to implement the third law of robotics in Spiny Shell. Luigi never did tell Mario where the koopa's really come from. Life Hack: sit on hay for relief from robosaurus. After all these years Luigi got fed-up at Mario always taking the spotlight. After this, that would not be a problem. 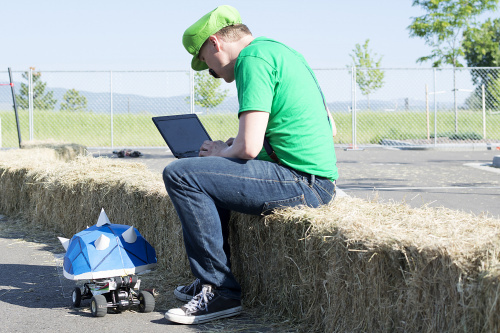 In hindsight, sitting Luigi next to Koopa in SparkFun's workshops couldn't have ended well. Luigi, determined to make a splash at Maker Faire one way or another, searches SparkFun for the final 8 bits. Well structured Shell coding, will make Coopa Troopa come out of his shell! Coopa@Troopa:~$ cat Coopashell | grep "It'sa me.... Luigy!" Jim, was Spocks half brother. He was so entrenced in solving the latest problem he didn't notice the killer robot had silently moved up beside him. // Mama mia! If this works this may be the start of my long overdue career change! I CAN'T STAND PLUMBING!!! When your blue shell blue screens "shutdown -r -f" is your only hope. Luigi looks for the code in the bug. Why did I go into plumbing? I really should have studied computer science! Luigie is looking at mashed potatoe recipes. The final moments before Luigi unleashes the blue shell on number one, Nathan "Mario" Seidle. When Luigi began talking about a reboot, we were relieved to hear that he wasn't referring to the '93 film. With the blue shell out of commission; Luigi must search sparkfun's website for spares. After using the blue shell one to many times; Luigi lost all his friends and has to search online for more. Dissatisfied with his luck in question boxes, Luigi decides to make his own luck for this race. After getting his Karting license revoked, Luigi turned to his old enemy to get his racing fix. Huh. FollowSmugSatisfaction() is a command? I missed that in the quick reference. Paste this under Void Loop and I should get unlimited 1-Ups. A disgruntled Luigi sits alone, frustrated that he couldn't initiate the LowerBowserShell subroutine nor find his traditional brown shoes this morning. Cursed shell, man pipe - must hash! Dear Mario: I'll be a little late finishing the race. The new Sparkfun shrink ray is pretty powerful. I'll just use my AVC entry to find Princess Peach, and win my prize! Luigi compiles his new shrinkify code so he can fit into the Trojan Koopa! Proving once again that the geek never gets the girl. Luigi busy reverse engineering the blue spiny targeting matrix. Mario leaves all the programming in the very capable hands of Luigi. Undefeated since upgrading his blue koopa with GPS, Luigi Skypes his brother to rub another victory in his face. Luigi suddenly recognized a turtle wasn't going to win in the AVC; but he made up for that loss in the battle bot arena with a quick change of code and spikes. "Nobody will suspect a thing." Luigi muttered conspiratorially to himself. "This going to be just peachy!" Anyone can compete at the annual AVC, even Italian plumbers! Pet robots are so cute when they are young. No body would have believed Luigi's humble entry into AVC 2015 would later evolved into the dread Blue Shell of Death. Luigi, the frequent getter of the BSoD, still can't program his way out of second place no matter which shell he uses. I knew I shouldn't have bought that Warduino clone. I think I will hang out in 2nd place at AVC this year. Fired as a plumber, Luigi finds opportunity at the DoD. "Let's a see those terrorists run from a me! Wahoo!" After going through all the effort of capturing a Red shell from the Mario Kart virtual world and bringing it into reality, painting it blue to cover his tracks and using it in the AVC, Luigi discovers his fatal flaw. The Red shell only finds the leader and follows him. It can never win, the best he can do is SECOND place...NOOO! Why must he always be plagued with second place. The famous gaming console company has started a new drone development team to 1up the competition. Behold AVC's advanced AI seeking obstacle. Complete with stylish henchman. Finally we know the person who has caused so many friendships and controllers to fall to "Blue Shell Rage" on the karting circuit. May justice be served. Why separate racing from battle? I can win both! Job taken by the recent automation boom, Luigi decided to increase his skill set. In order to safeguard his NSA treasure trove of information, Snowden preps his latest invention, the flying "Encrypt-o-capsule", (AKA: The Gamera Project), for final upload of all stolen NSA documents. I know I put that program in here some place. An NSA official puts the final touches on the software of the latest in stealth WiFi surveillance. The Gamera II, MIRV warhead delivery system undergoes final testing. Nobody puts Luigi in the Corner! Luigi checks the postage on his special delivery to Bowser. Luigi searches for the unfortunate sign error in his vector math. with the shell complete; luigi grew ever more excited to finally beat his brother. Rainbow road was his this time. Clark realized that his three year second place streak in the account could Coe to a sudden end if he added a blue shell deployer to his new vehicle. That Mario just pissed me off with his fast Goomba racer. Time to upgrade my guy to a spiked shell! Clark's new anti virus software fails to eradicate the latest in virus technology from Asia-- Gamera. Having had it's fleet of drones grounded by the FAA, Amazon turns to it's latest delivery system, "The Gamera Project" to deliver Clark's latest purchase, a now warm can of soda. Clark powers down his new hay bailing robot after the first successful run. Filling out the Sparkfun CEO application with help from the robot career development coach, while getting a crackload of chigger bites. Unbeknownst to Clark, the latest in NSA surveillance devices rolls up to greet him as he finishes that last music download. Clark becomes aware of the devices presence only when it announces itself by saying: "Hello Clark, it is good to meet you-- at last. Enjoying your illegal music downloads?" Hey I just met you, and this is crazy, but you're in first place. Blue shell maybe? Ok, fine. I'll take you over to watch the AVC trials. Just let me finish this Tetris level. Stop looking at me like that. It isn't my fault you got a virus surfing those battlebot sites. The rental car looked bigger on the website. You know, because he's sitting on hay bales. Bad, I know. The day Luigi unfriended Mario. Line-follower calibration - Check. Range-finder calibration - Check. Pneumatic banana cannon - locked and loaded. Alright, let's do this! Mario: (in the background) "It's Me,Mario!" Luigi: (eyes and mustache twitching) "This ends now"
Just a few more lines of code and I'll no longer be Player 2. OK, Blue Shell. Let's find out which castle she's really in. Well, the Arduino is Italian. Now first place is all but guaranteed if I can just avoid those pesky banana peels! As if the the Luigi death stare wasn't enough, Luigi takes it to the next level by hacking the Blue Shells!